Probability and Statistics > TI83 for Statistics > Free TI83 calculator online. Buying a TI83 calculator for class can be a chunk out of your budget, especially if you have to wait a few weeks for your financial aid to come in. With statistics classes, a good graphing calculator is a must. Did you know that you’re able to get a free TI-83 calculator emulator that allows you have to have a desktop version of the calculator? The calculator looks and works exactly like the physical calculator. The virtual TI83 calculator has all of the functionality of the hand-held version. You can perform the same calculations, run the same statistical tests, and create exactly the same graphs. There’s no programming or complicated file installation: just download and click. Step 1: CLICK HERE to go to a trusted Google site download page. 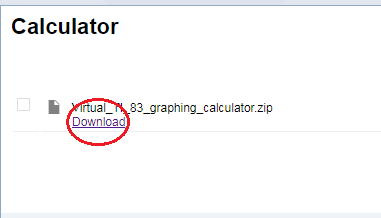 Step 3: When the program has downloaded, click the download file (if you can’t find it, check your downloads folder, the file will be called “Virtual_TI_83_graphing_calculator.zip.” If you see this file when you click the folder, go back to your downloads folder and find the “Virtual_TI_83_graphing_calculator.zip” file. 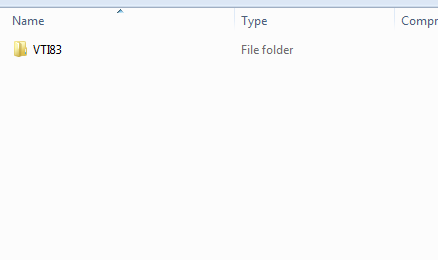 Step 4: Right click on the zipped folder and click the “Extract All” button. 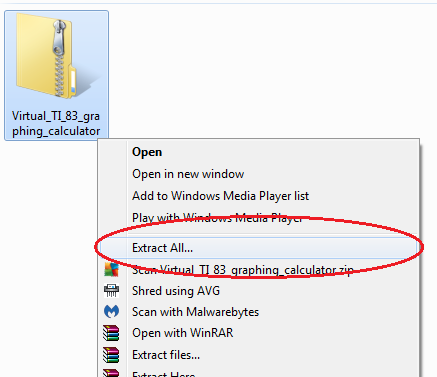 Step 5: Check the box “Show extracted files when complete” and then click “Extract”. Step 6: Once extracted open the file “VTI83”, and then open the program titled “vti83”. ← Probability Problems: How to Solve Probability Problems the Easy Way!